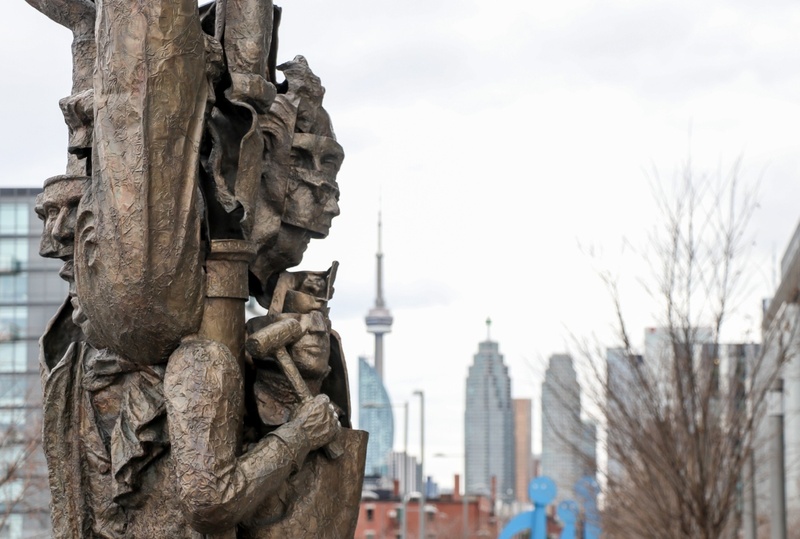 As Toronto grows, so does its collection of public art. 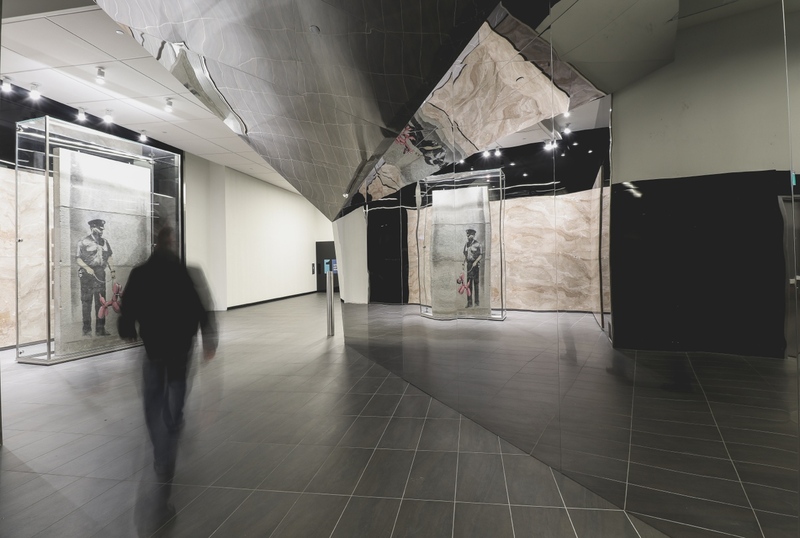 From large scale projects under a highway underpass to beautiful murals inside condo lobbies, the city’s extensive collection is filled with fun, dramatic and engaging works from a variety of artists. 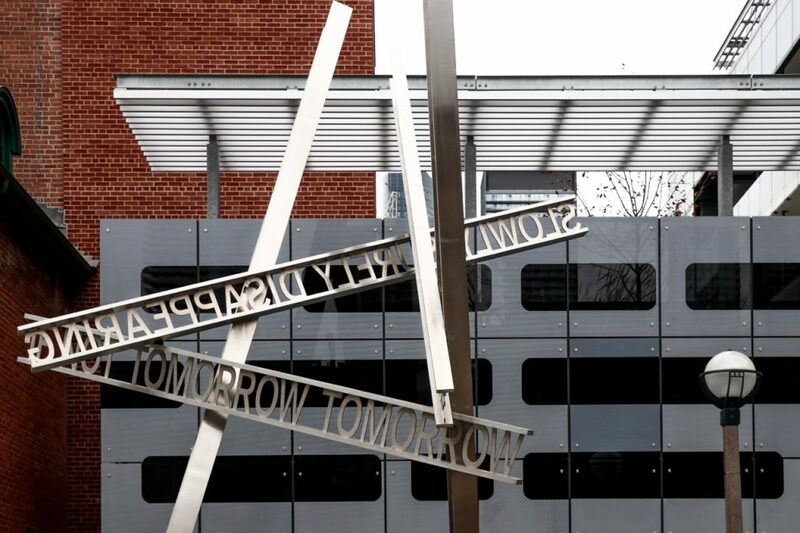 We walk by some of the city’s most stunning pieces every day, without knowing their history or meaning. 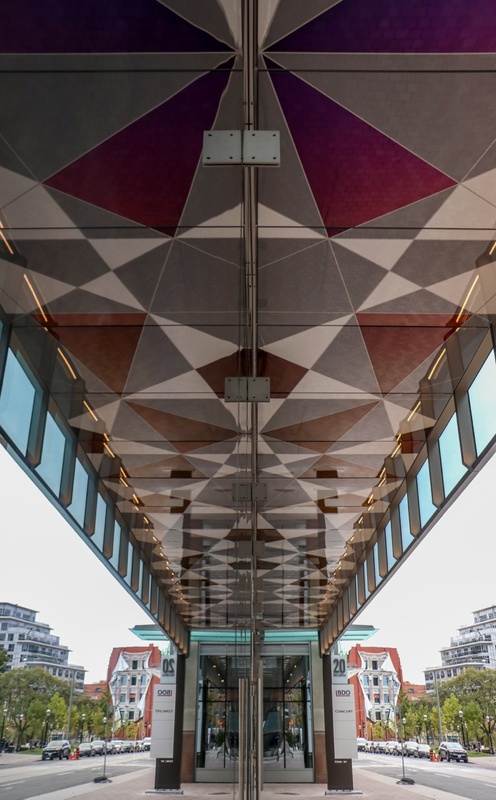 As we’ve done in the the past, BuzzBuzzNews has put together a photo tour of some of the newest, and most striking installations across the city. All photos by James Bombales. 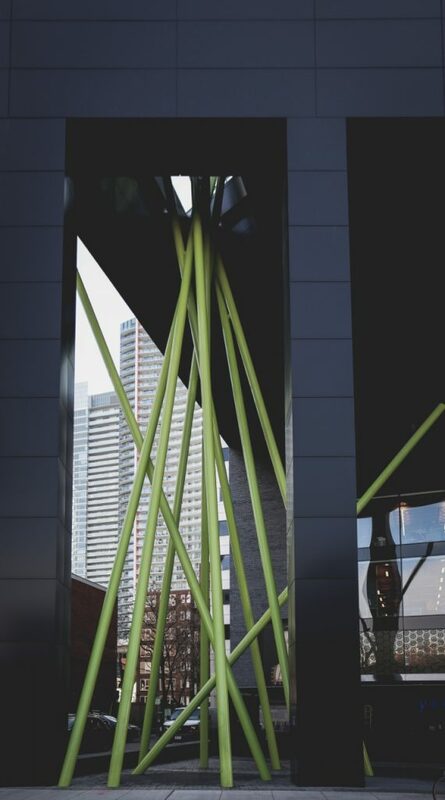 Artist Shayne Dark’s signature steel poles serve as the focal point of the four-storey public plaza at the base of Tableau Condos in downtown Toronto. 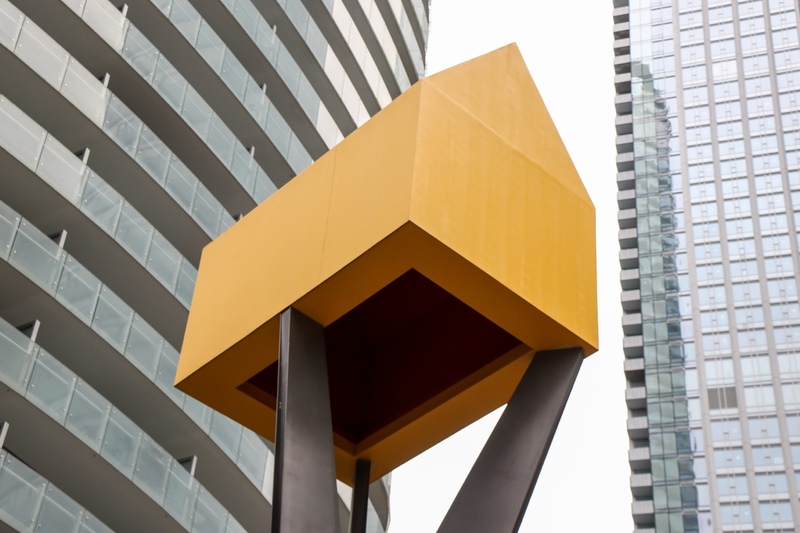 Nova is Dark’s third public art piece connected to a residence after being commissioned for ‘Double Vision’ at X Condos and ‘Double Take’ at neighbouring X2 Condos. 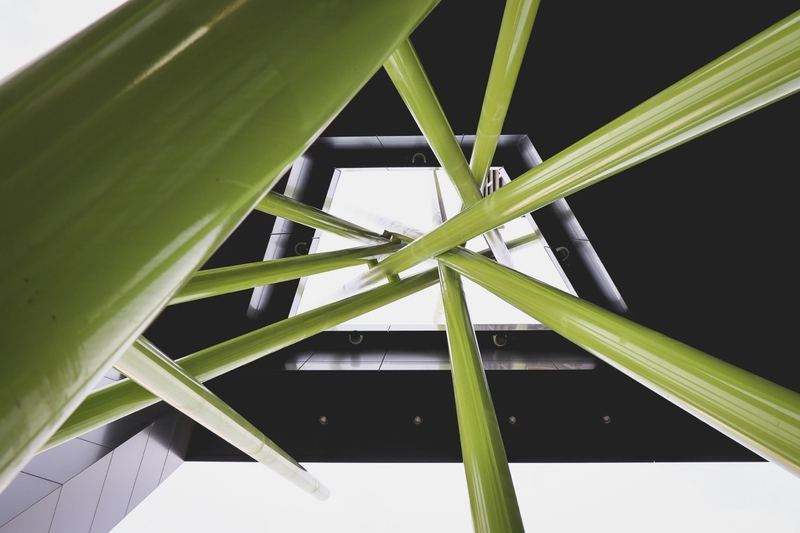 Unlike some art installations within residential developments, Nova is directly integrated with the building, as its bright green columns pierce through the plaza’s concrete slab ceiling. Designed as a three-dimensional ‘river’ of light and colours, Spectrum by Cecil Balmond flows across the ceiling in the L-shaped atrium at the base of 88 Scott Condos. 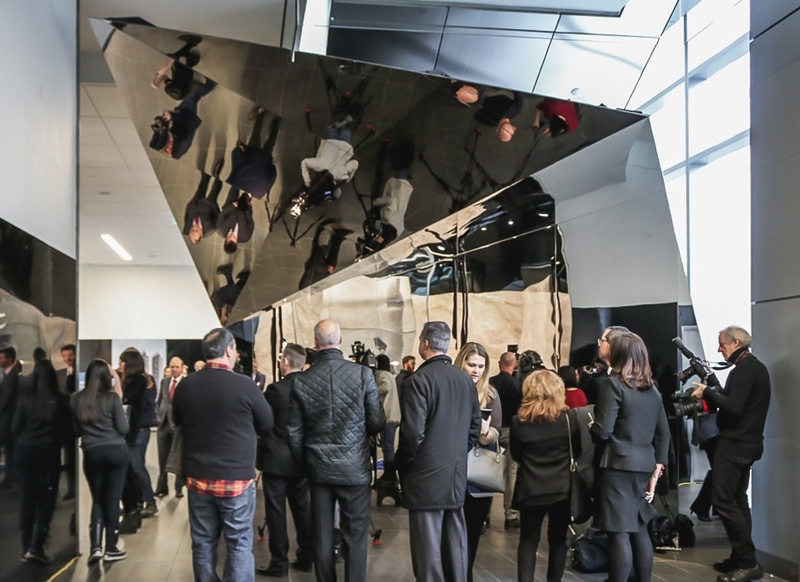 Its jewel-like geometric, polycarbonate forms light up the space by reflecting both artificial and natural light. The artwork continues on the exterior of the building with a secondary two-dimensional piece extending under the soffit of the retail podium. 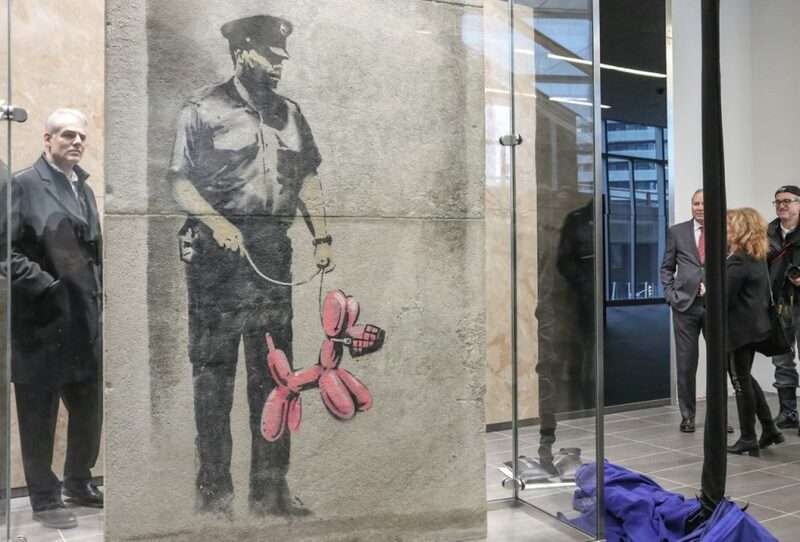 Enclosed within a glass display inside the PATH pedestrian walkway, Banksy’s work is stenciled on large limestone slabs which were originally part of the vacant building that was demolished at 90 Harbour Street. It was one of six works attributed to the internationally-renowned graffiti artist during his visit to Toronto in May 2010 following the release of his film ‘Exit Through the Gift Shop.’ When Menkes purchased the property in 2011, the developer had the slabs removed, preserved and professionally restored during the construction of the building. 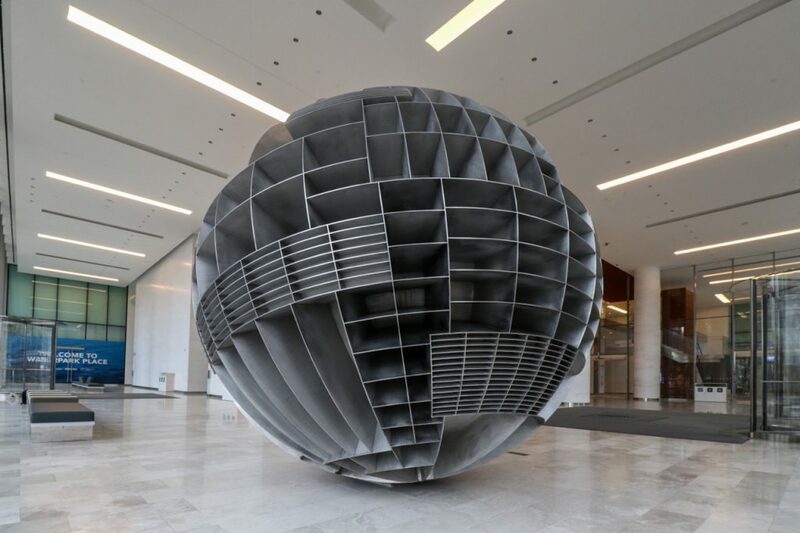 This 12-foot Earth-like sphere is composed of waterjet-cut stainless steel plates that form a series of compartments of different shapes and sizes. The piece by American artist Roxy Paine is completely hollow inside but still weighs in at almost 7 tons or 14,000 pounds. 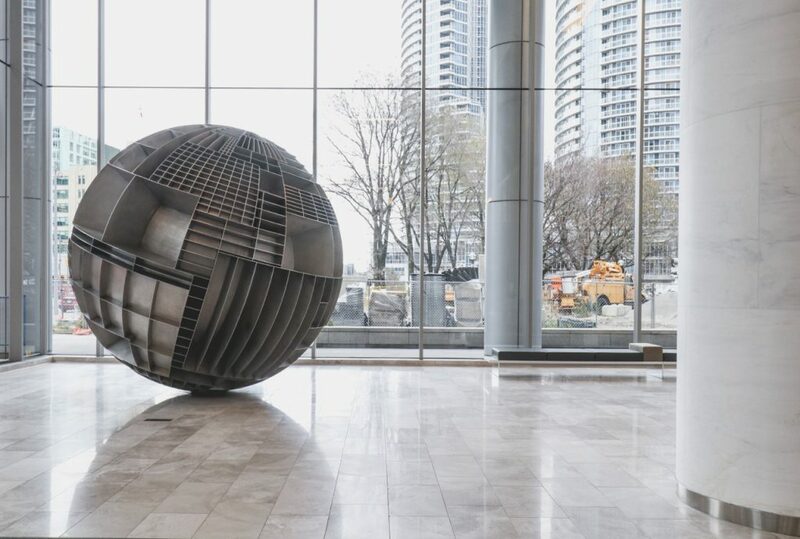 It can be seen in the glass lobby of the RBC Tower at 88 Queens Quay. 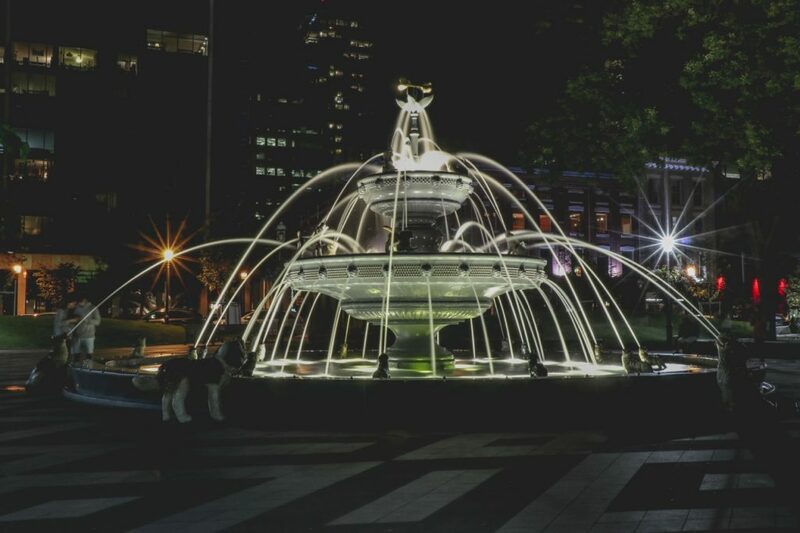 Situated behind Toronto’s iconic Gooderham (aka Flatiron) Building and across from the St. Lawrence Centre for the Arts, Berczy Park is a popular destination for both tourists and residents alike. 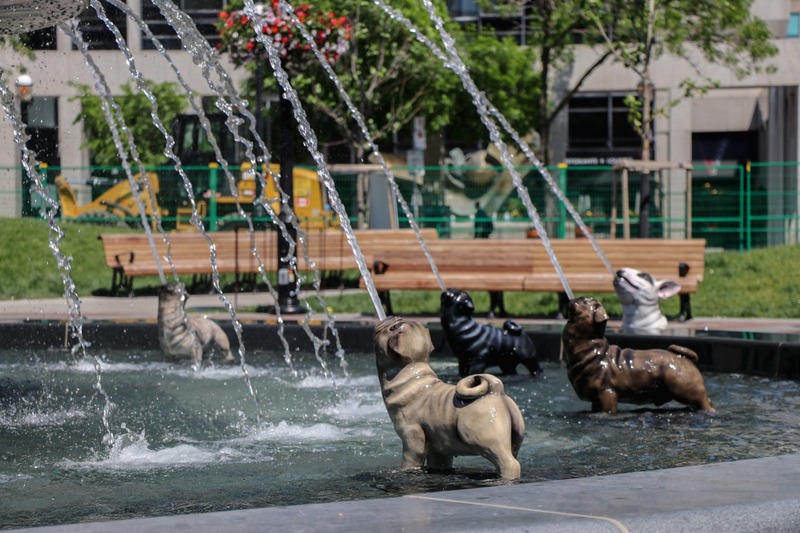 The triangular-shaped space recently received a $7.2 million makeover by landscape architect Claude Cormier that includes new trees, benches and a two-tiered Victorian fountain outfitted with dozens of life-sized dog figures as a nod to the neighbourhood’s many dog owners and their four-legged friends. As a master of minimalism, architect Mies van der Rohe was well known for his motto “less is more” when describing his design aesthetic. The TD Centre complex in Toronto’s Financial District was one of his last major works when it was completed in 1969 and is a classic example of his modernist style with its simple, grid-like patterns on a stark, black exterior. 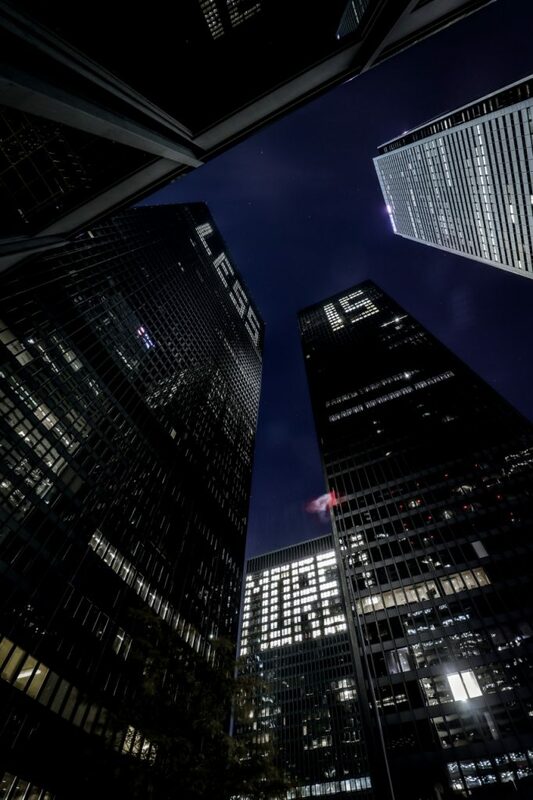 To celebrate the 50th anniversary of the opening of the first tower, French-Canadian artist Aude Moreau used the skyscrapers as a canvas for a public art piece over the 2017 Labour Day weekend. 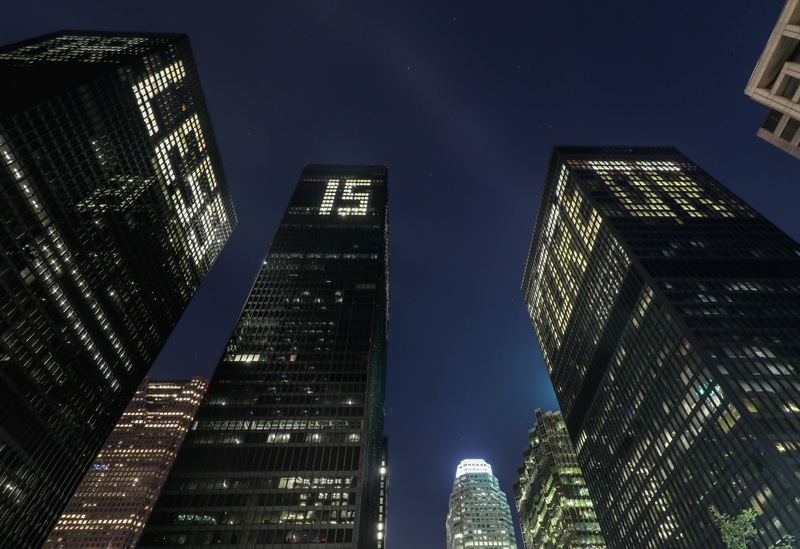 Using a series of lit and unlit windows, Moreau formed the words “LESS IS MORE OR” on the tower’s top 10 floors. Moreau’s variation of van der Rohe’s words with the addition of “OR,” serve as an invitation to the viewer to reconsider the values of modernism, leaving it open to interpretation and various viewpoints. 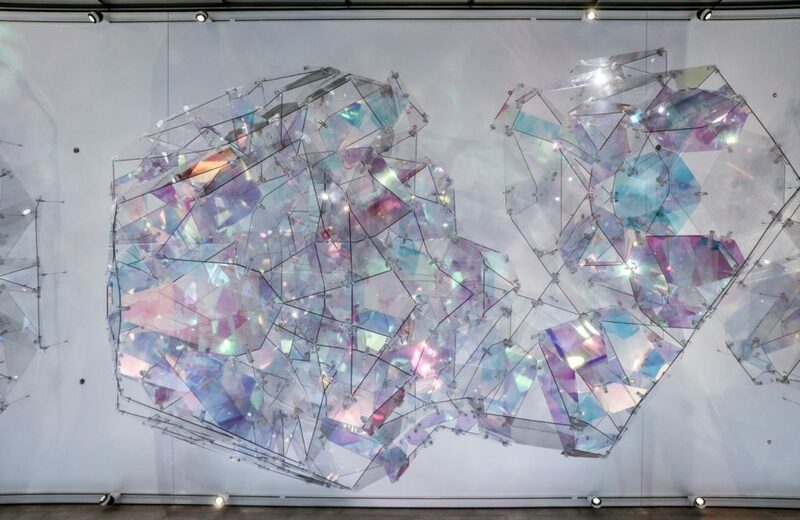 “I wanted to revisit the interpretation of the evolution of modernism and the possibilities of what is to come . . . to say ‘what now’,” said Moreau in an interview with the Toronto Star. 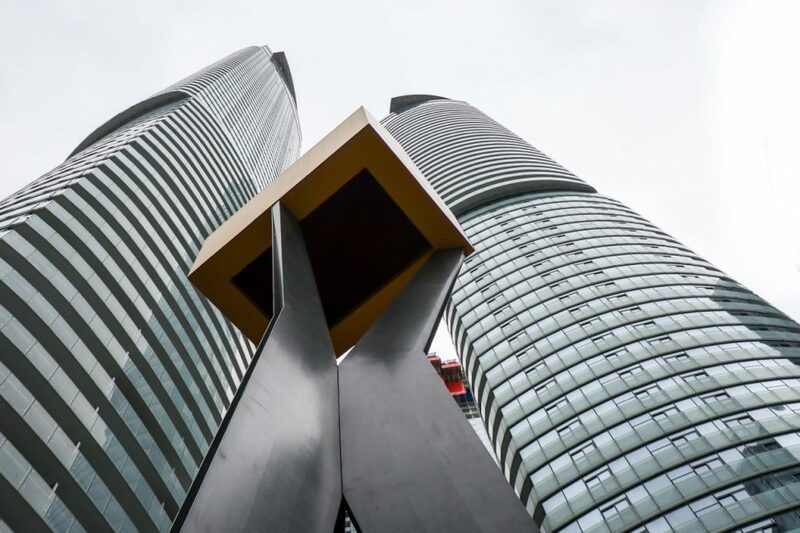 Created in 2015, “Dream House” sits outside of ICE Condos, a simple yellow house suspended 16 meters into the air by sculpted metal stilts. The piece is intended to highlight the universality of the home, asking the question of what it means to belong in a large global city. 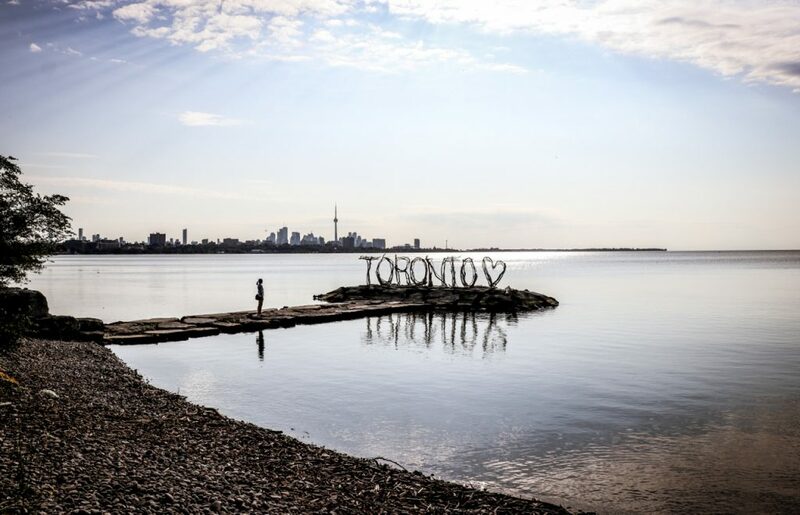 This six foot-tall birchwood sign appeared on an outcropping of rocks at the Humber Bay this summer, prompting Torontonians to wonder about the mystery artists who had created it. 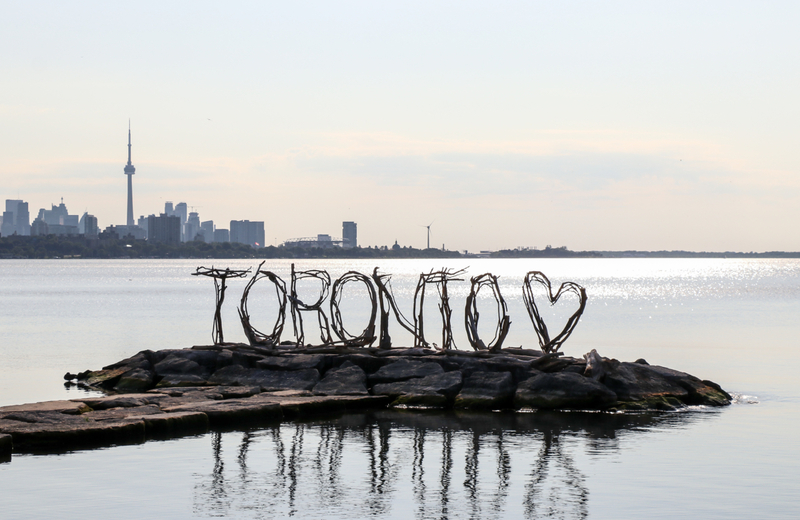 Thelia Sanders Shelton and Julie Ryan — local artists and best friends — used driftwood from a nearby beach to create the sign, inspired by a call from the Toronto and Region Conservation Authority for driftwood artists to create signs for Canada 150. 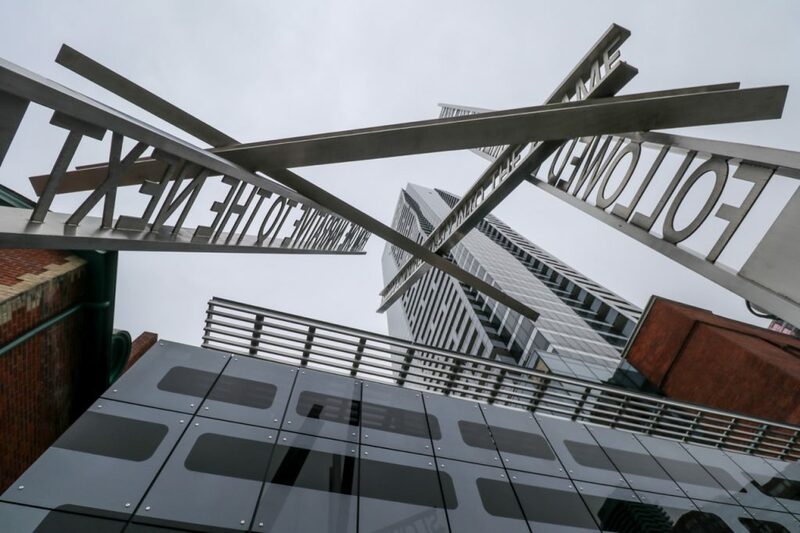 The artists admit that, due to the natural materials and exposure to the elements, the sign has a short shelf life — today, it is less defined than it once was, but still worth a visit. Created by Canadian artist Ron Baird, “Charity” has received its fair share of outrage since its installation earlier this year. 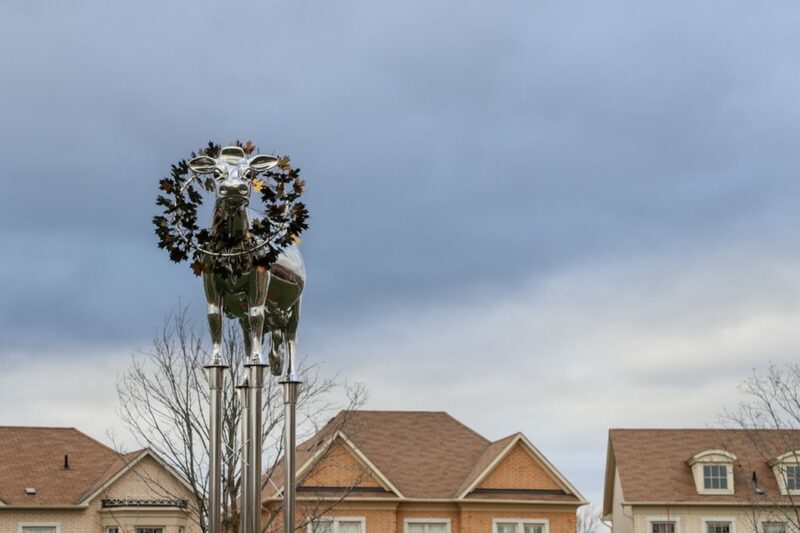 Standing at nine-meters tall in the middle of the sleepy Markham suburb of Cathedraltown, “Charity” is a surgical grade stainless steel cow, polished to reflect the colours that surround her. 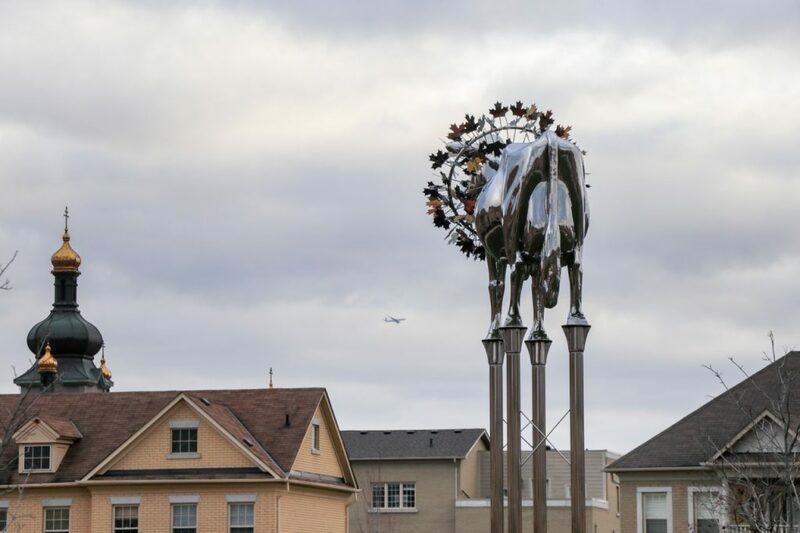 Donated to the city by Baird, the statue is a tribute to “the world’s most famous cow” — Brookview Tony Charity, an award-winning Holstein cow that was owned by the farm where the Cathedraltown now sits. Residents have complained about the statue’s domineering presence in their neighbourhood, saying that it frightens their children, and attracts unwanted sightseers. Nevertheless, as of October, Baird says it is there to stay. Created in 2014, “Nyctophilia” or “love of the night” can be found at the corner of Weston Road and Dennis Avenue. 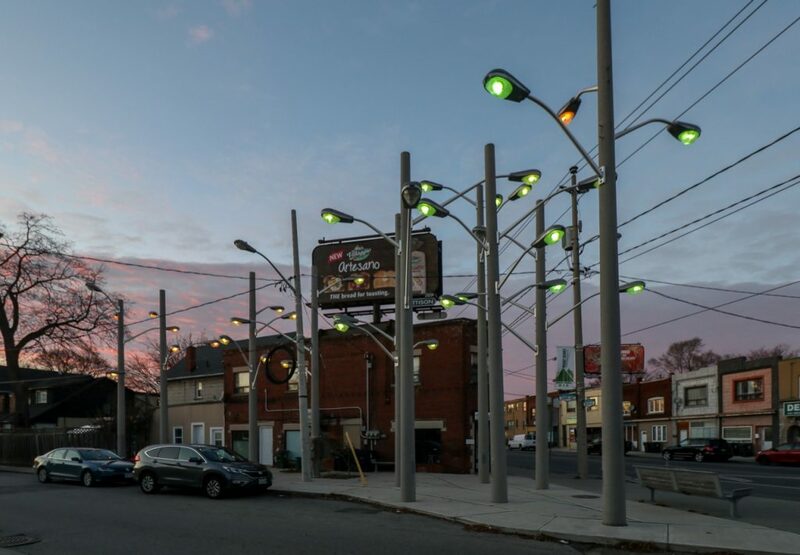 The piece is made up of 10 utility poles, with 36 street lights jutting out in different directions. 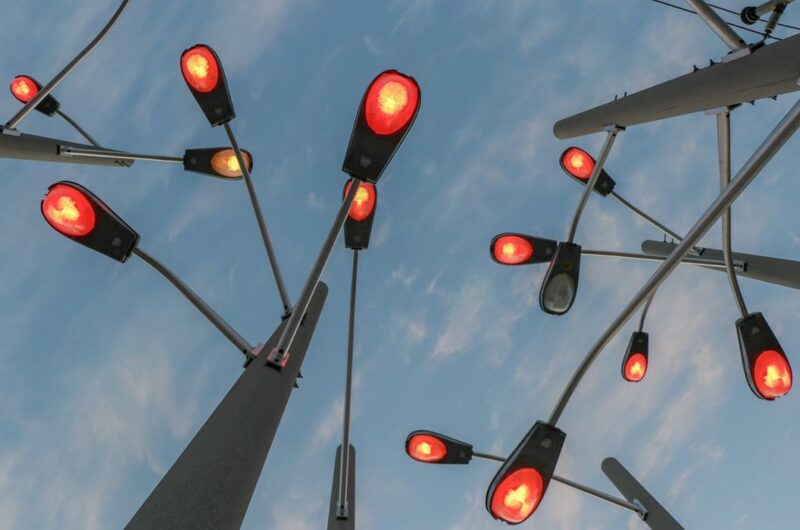 Each street light can be programmed to feature a different LED light, creating beams of multicoloured light as soon as the sun goes down. At first glance, “Garden of Future Follies” looks like a series of oversized chess pieces, laid out across the Front Street Promenade. But the collection is drawing on the history of 18th century garden follies, which would depict Chinese temples, pagodas and pyramids. 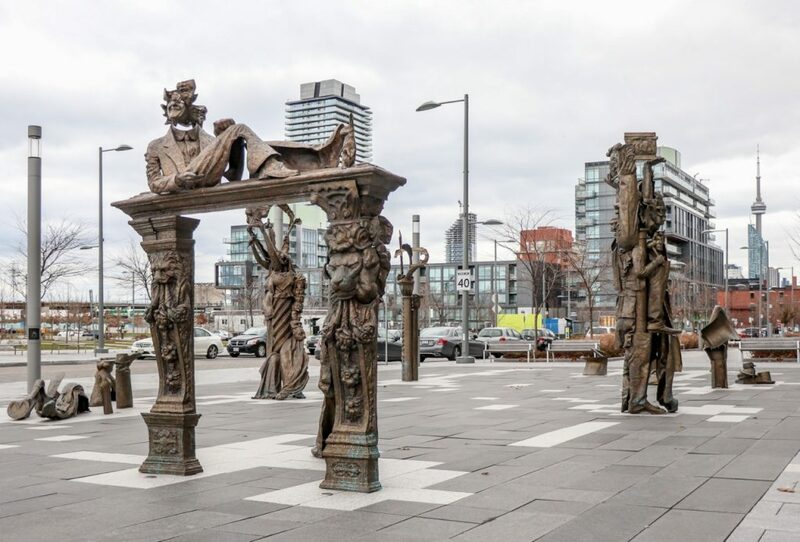 These “future follies” are intended to draw upon Toronto’s past, while still maintaining a whimsical and fantastical element. 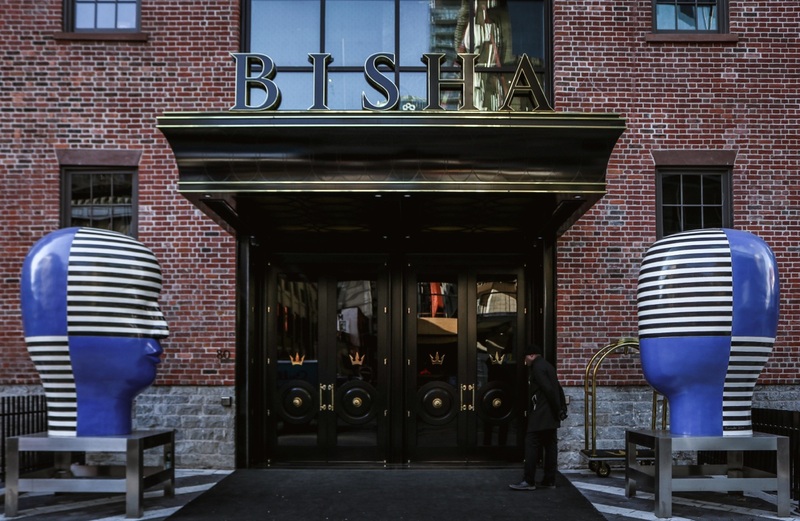 Created this year, in tandem with the Bisha Hotel and Residences, “Untitled (Heads)” features two seven foot-tall bronze heads, each resting on stainless steel. 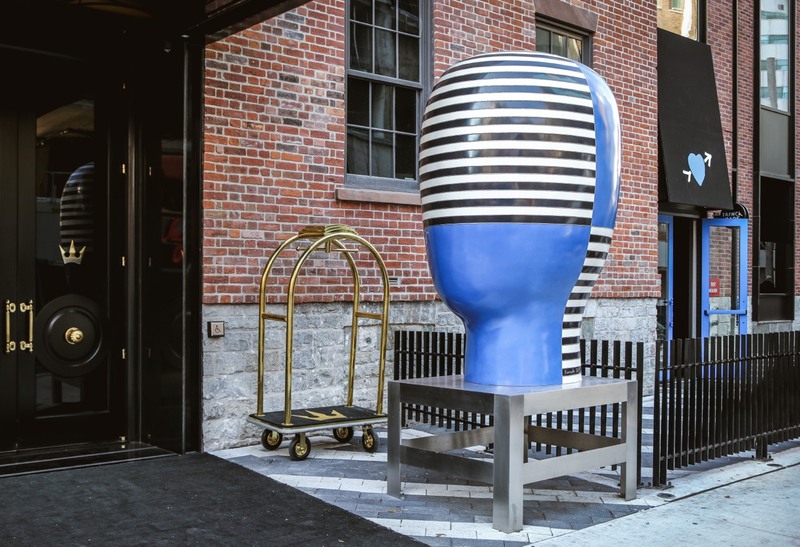 The heads are a mix of blue and zebra-stripes — the first of the series can be found at the entrance of the Gardiner Museum, three kilometers north from its newest counterparts.